In this Image Form, there is a harmonious blending of the two states of master and vassal (seshi and sesha). Universally, Bhagavan is the Seshi while all the souls are his seshas; whereas in the Image Form, the devotee becomes the seshi and Bhagavan, the Sesha! The Lord remains under the control of the priest and the devotees, allows Himself to be decorated by them in the manner they choose, and also accepts all types of food offerings made by them, and at the times chosen by them. Thus He exhibits infinite patience while remaining under the control of His devotees. Further, He condones the deficiencies in their prayers and offerings. Another indication of His voluntary subordination to His devotees, which arises out of His supreme independence, is that He allows Himself to be transferred from one devotee to another just as a piece of property, as in cases of division of Salagramas in households, on partition of a bequest. However, in order to establish that this Image Form is no less divine and powerful than the other four Forms, Bhagavan Krishna has declared in the Mahabharata (Mausala-parva) that His Para Form in Sri Vaikuntha has voluntarily appeared as the Image Form in the created world for the benefit of mankind. 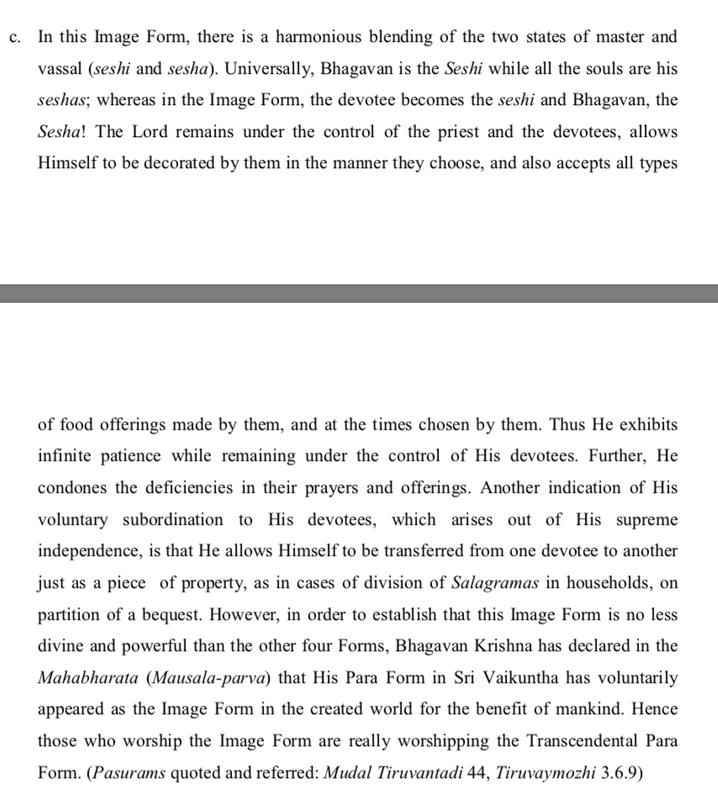 Hence those who worship the Image Form are really worshipping the Transcendental Para Form. I’m interested in the part in bold. My question is, where does Krishna discuss Vishnu’s Archa form in the Mahabharata? The translator says it’s in the Mausala Parva of the Mahabharata. You can read the Mausala Parva here; I can’t seem to find it. So is it in some other part of the Mahabharata? In any case it wouldn’t be surprising, considering that Krishna discusses worship of Archa forms in the Uddhava Gita. Arccāvatāramāvatu - 'tamarukantu evvuruvam avvuruvantāṉē - tamarukantatu eppēr maṟṟappēr', 'neñciṉāl niṉaippāṉ yavaṉavaṉākum nīḷkaṭal vaṇṇaṉē' eṉṉumpaṭi svayamvyakta-tivya-ārṣa-mānuṣa-vaiṣṇava-stānaṅkaḷilē sarvasahiṣṇuvāy arcaka pāratantryattiṟku ellai nilamāy śēṣaśēṣibhāva-śabalamaiāy 'bhūmau gatam pūjayatām prameyam' eṉṟu tāṉē aruḷicceyta rūpam. Vedanta Desika's quote from the Mahabharata Mausala Parva is emphasized above in bold text. The Lord is described as - āgamairgamyam - One who is accessible through the Agamas. The Devas say - Go O Lord! and save the mortals who have surrendered to you who are afflicted by repeated birth. From this it can be inferred that the Devas are praying that the Lord "enter the Archa forms as described in the Agamas, to enable the mortals to surrender unto him and thus save them". Having praised the Lord thus, the Devas shower the Lord along with Mahalakshmi with flowers. The Lord replies - Having gone to the Earth in my extraordinary four-handed form in order to be worshipped, I will always remain there. From the fact that the Lord says this in SriVaikuntha and the Lord's words that He would indeed go in his "four-handed" divine form to enable people to worship him, it can be inferred that the Para Form has descended from SriVaikuntha and inhabited the Archa form. This is what Svami Vedanta Desikan is saying. Not the answer you're looking for? Browse other questions tagged mythology mahabharata vishnu krishna sri-vaishnava . Where does Periyavachan Pillai discuss Mleccha devotees of Vishnu? What scriptures describe Shiva discussing selling salt in the Banasura story?